Nove su 10 viaggiatori cinesi hanno i mezzi e sperano di viaggiare più frequentemente rispetto a cinque anni fa. Il reddito disponibile più elevato, le soluzioni tecnologiche avanzate e l'accesso alle informazioni pertinenti del viaggio contribuiscono alla crescita continua dell'industria dei viaggi. Le motivazioni per i viaggi sono sempre più diversificate, ei viaggiatori non sono più soddisfatti della visita turistica tradizionale. SINGAPORE – 8 May 2017 – A study released today by Sabre Corporation (NASDAQ: SABR), a leading technology company serving the global travel industry, shared insights on the Chinese traveller’s evolving preferences, and major trends that are shaping China’s booming travel trade. Today, nine out of 10 Chinese travellers say they now have the means and are hoping to travel more frequently as compared to five years ago. Higher disposable income (20%), enabling technologies that make travelling more convenient (17%), and access to relevant travel information (15%) are the top three factors that have contributed to this increase in travel. Today’s new generation of travellers – the digital natives who grew up with the Internet – tend to be more demanding when it comes to travel experiences, and are motivated beyond traditional sightseeing. 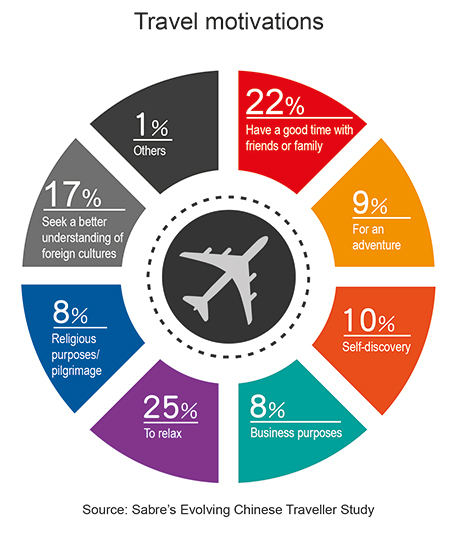 The top three motivations for these travellers are to find an outlet where they can relax (25%), have a good time with friends or family (22%), and seek a better understanding of foreign cultures (17%). Looking specifically at the factors that motivate today’s new generation of travellers, there are two overarching attitudes toward travelling. While 49% of the respondents see travel as a means of personal improvement, over half (51%) of the respondents say it has become a new form of social currency. For the latter, this means that travel has become a platform to connect and build stronger emotional bonds (57%), and a way of enriching their life experiences to share with friends and family (56%). China is entering a new era of “mass tourism” where travel is increasingly becoming a norm and an expected experience. As such, more travellers are starting to pay attention to the quality of travels and are now more inclined towards personalised travel experiences. 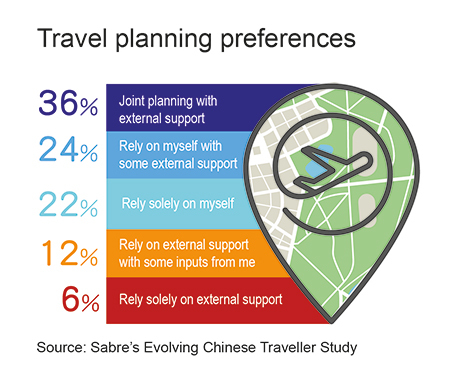 Today, travellers seek the flexibility to plan independently so much so that a majority of respondents (74%) expressed that they are willing to spend time and energy on their travel plans. This reflects the growing sense of self-empowerment and investment in personalising travel experiences. However, having more control over travel plans does not come at the expense of external support and trip guidance offered by travel providers and agents. 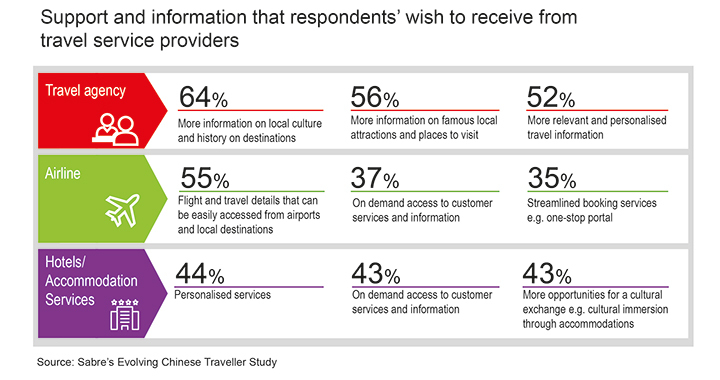 In fact, many Chinese travellers (78%) still welcome and value support from friends, relatives and travel service providers. Three to five years ago, respondents felt that there was a lack of travel information available to them (60%). Now, nearly half of the respondents (46%) believe that there are too many travel options and information available. With so much information out there, travellers need support and help from travel service providers to cut through the clutter and determine what is useful and relevant for them. “Technology and the continued increase in disposable income are driving today’s Chinese travel industry growth. As traveller motivations and preferences evolve, there is a great opportunity for the travel industry players to support and cater to their needs,” said Chen. Sabre is bringing more data-driven decision support tools to market this year that will help airlines, hotels and travel agencies track and understand their customers’ evolving profiles in order to create more personalised and relevant experiences for travellers.